Three really is the magic number when it comes to Triple Profits; a three reel and three row multi-spin slot which takes money in all of its forms as its simple yet fun theme. Boasting a bonus game, as well as its marvellous multi-spin capability and a large paytable, the slot has a generous 98.72% theoretical return to player percentage. Perhaps the plethora of money themed symbols on the reels, then, are a good omen of things to come for Triple Profits players. The Triple Profits slot boasts a comparatively generous top jackpot of £75,000 that can be won at the highest available bet level. A bonus game, large paytable and the inclusion of wild symbols all mean that the games theoretical RTP percentage is impressively high. Those additional features, together with the multi-spin capability, make gameplay more fun and immersive. A good variety of coin value and bet level options give players a good level of control over their staking. Below the impressive top jackpot, payouts for less valuable symbol combinations do fall away quite significantly. Players used to more straightforward slot formats, may find the Triple Profits multi-spin setup a little complicated. Thanks to the slot’s innovative multi-spin format, players are able to achieve a top jackpot worth three times the most valuable Triple Profits payline payout – hence the game’s name. That top jackpot results if a player sees a three symbol combination made up of the game’s gold bar wilds line up along all three rows. The three gold bar combination, after all, pays out at a rate of 1000 times the player’s bet per row. If the maximum bet per row of five coins and the top coin value of £5 is set, therefore, the top jackpot can return a life-changing £75,000. 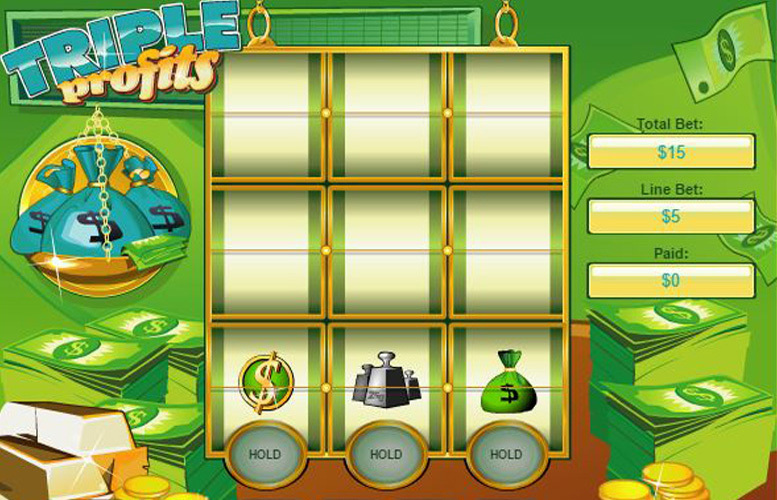 Triple Profits is a fun and an interesting slot, which offers players an array of additional features to make gameplay more immersive. These are namely the game’s multi-spin feature, its wild symbols and its bonus game. Rather than simply spinning the reels once and hoping for the best, Triple Profits players have the opportunity to use their skill and knowhow to boost their chance of winning. A first spin, after all, sees just the game’s bottom row display symbols and players can then hold whichever of those symbols they like before choosing to spin again. We’ve already explained how the Triple Profits gold bars symbols can deliver the game’s top jackpot but they also work as traditional wilds, too. That means that when they appear anywhere on the reels, the symbols can substitute for any other to make up the most valuable possible combination. As if the multi-spin main game weren’t enough, Triple Profits also boasts a fun bonus game. That game is triggered by three stack of money symbols lining up along a row, and asks players to choose two bags of cash from a choice of 12. The choices that the player makes determine what instant payouts they receive. The gold bar wilds and stacks of cash bonus symbols, therefore, are arguably the most important in the Triple Profits slot but there are loads of others that can deliver impressive payouts too. All of the game’s symbols are money themed, and include depictions of differently coloured dollar symbols that make up the most valuable combinations aside from the slot’s wilds. Three of the slot’s red dollar sign symbols when lined up on one of the three rows, for instance, delivers a jackpot worth 100 times the set bet level. Three of the green dollar sign symbols, meanwhile, pays out at 75 times the bet level and three blue dollar signs delivers a 50 times payout. Unlike most more traditional slot games, the multi-spin Triple Profits slot does not offer players control over the number of active paylines. What it does allow for, however, is the alteration of both the number of coins wagered on each of the game’s three rows and how much those coins are worth. Anywhere between one and five coins can be bet per row and there are loads of coin value options between the minimum of 1p and the maximum of £5. What all of that means is that an overall minimum of 3p can be bet per spin, whilst a maximum of £75 is also possible. They say that money makes the world go round and whether that’s true or not, it certainly helps to make Triple Profits an impressive slot game. The slot’s combination of cash and money themed symbols and features as well as its generous top jackpot, after all, is sure to keep most players happy. That top jackpot of £75,000 is indeed comparatively high and the multi-spin capability of the game means that a player can utilise an element of skill in seeking to try and win it. 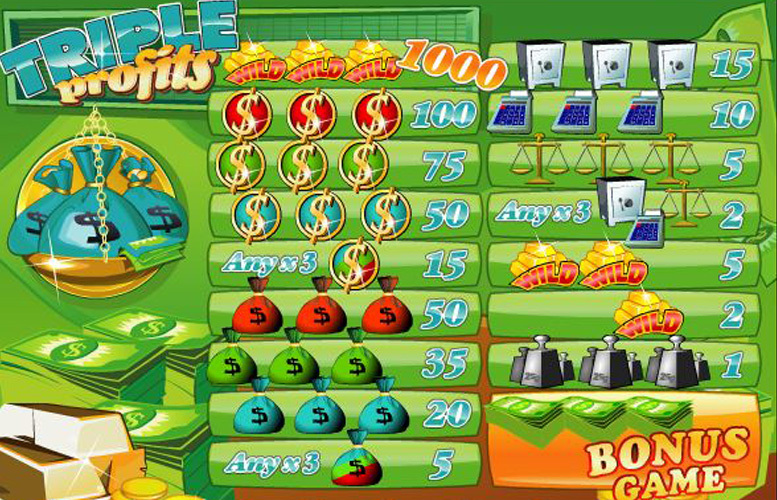 The fact that the slot’s other payouts are considerably lower, however, can be seen as something of a disappointment. Outstanding control over staking and really immersive gameplay, on the other hand, mean that the slot’s entertainment value really cannot be questioned. This game has a rating of 4 / 5 with 615 total reviews by the users.